When I was an undergraduate student taking an introductory Philosophy course, I had an “aha” moment when I read Plato’s myth of the cave which describes a man living in a cave, thinking it is the real world until light streams in from above, at which time he realizes that what he has been experiencing is not the real world but an illusion. The real world is, in truth, somewhere else. It is this kind of subliminal narrative that forms the emotional and intellectual core of The Matrix, a thought-provoking, action-packed thriller about a human rebellion against a world controlled by machines. Thomas Anderson, a computer programming guru, is also known as “Neo,” a computer hacker with an unsavory clientele for which he provides all sorts of illegal substances. 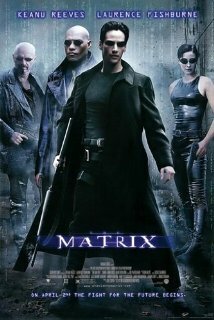 One evening he is contacted by Trinity, another computer whiz, who apprises him of Morpheus, a mysterious man who can tell Neo the meaning of “the Matrix,” an entity that Neo frequently encounters online. Neo is interested in meeting him, but three robot-like men are determined not to have the meeting take place. In spite of obstacles, and there are many, Neo and Morpheus meet, after which Neo’s life is forever changed. Offered a red pill by Morpheus, Neo takes it, and the pill enables him to see the world in a totally unconventional way. He embarks on a psychic journey, which convinces him to join Morpheus in his quest to overthrow the mechanical forces of conformity and rigidity that are presently controlling the world. Morpheus tells Neo that in the 21st century, there was a war between human beings and the intelligent machines they created. Eventually the machines won and trapped the humans in an artificial world, the Matrix, in which humans exist in a simulated environment. This keeps them compliant slaves to materiality, without the freedom to question and to think on their own. Morpheus seeks to rebel against this universe of conformity by hacking into the Matrix and recruiting enslaved humans to rebel against the machines. The rebels’ profound understanding of the artificial reality of the Matrix allows them the bend the laws of the physical world, giving them superhuman powers that are choreographed with visceral energy on the screen. We learn that Neo is recruited specifically because Morpheus sees him as “the One” to save the world from the corrupt machines, and he is trained to do battle with their human-like representations. The movie’s dense plot almost requires a second viewing in order to comprehend the complexity of the conflict between the men and the machines. The essential question that the film poses is what is the nature of reality. Plato’s cave metaphor suggests we are living in a world of illusion and we have to exit the cave if we are to live a full and honest life. The matrix represents this world of illusion, and the rebels want to live a real, not artificial, life. Jewish tradition encourages us to dream, to have illusions, but we must have our feet firmly planted in the real world. The patriarch Jacob dreamt of a ladder reaching to the heavens, but the ladder was rooted in the earth. Moreover, our Sages encourage us to contemplate other planes of existence, such as the heavenly World-to Come, which gives us spiritual pleasure. Nonetheless, they remind us that it is in this world, the nitty-gritty everyday world, the world that the rebels want to revive, that we express our humanity through the crucible of real life experiences. It is here that we truly accomplish our life’s mission and fulfill our personal destinies. Free choice makes us human and reflects the divinity within us. The Matrix suggests that for humans to fulfill their potential as human beings, they must be able to freely choose life over death, light over darkness. I always enjoy reading your reviews and this one was one of the best yet! Its legacy has definitely been tainted by the sequels, but it’s still a fine movie nonetheless. Good review.